INGREDIENTS: Organic Rye Flour, Organic Canola Oil, Organic Cane Molasses, Organic Peanut Butter, Organic Banana Purée, Cannabidiol (CBD) Hemp Oil. At CBD Allies our organic peanut butter and banana dog treats come in 6mg for dogs Up to 40 lbs. 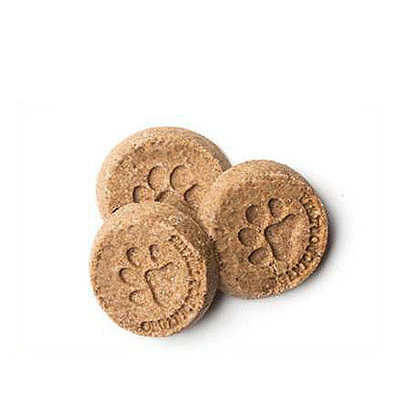 Have a larger dog give 2 6mg treats for dogs up to 80 lbs you can also double up for holidays such as 4th of July fireworks. These treats are made with six all natural human grade ingredients and help with anxiety, pain and so much more. Contains 25 dog treats. This stuff is magic! Our fur baby Bear (1 yr old Shihtzu) experienced his first 4th of July and we were concerned that he would be affected by the fireworks and festivities. I purchased the biscuits and it helped Bear a lot. He is prone to separation anxiety but he didn’t seem to be bothered by the very noisy fireworks and the 10 or so guests coming in and out of the house to enjoy the fireworks. We were very lucky to come across this product when we did. We recommend this product and plan to try the other products SOON!